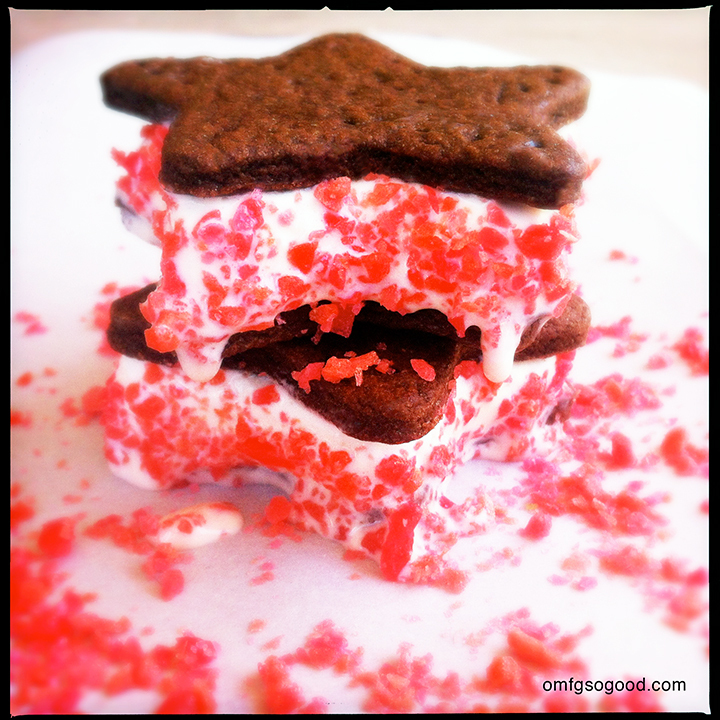 firecracker ice cream sandwiches | omfg. so good. I do have to say that I was hoping for way cuter photos of these guys. Alas, it was 110 degrees outside and they immediately started melting when I set the tray down at my little make-shift photo studio, which happens to be on our back patio. Someday I’ll be rich and famous enough to have a professional photo set-up in the extra room in our mansion. But until that day, I’m at the mercy of the sun’s current position in the sky, sweating ballz while rattling off as many photos with my iPhone as I can before my kids whiz by on a tricycle and steal whatever happens to be on the plate. I know, I know. Enough whining. It’s firecracker time! Line a 9 x 13″ baking dish with parchment paper (or foil), allowing excess to hang over the edges. 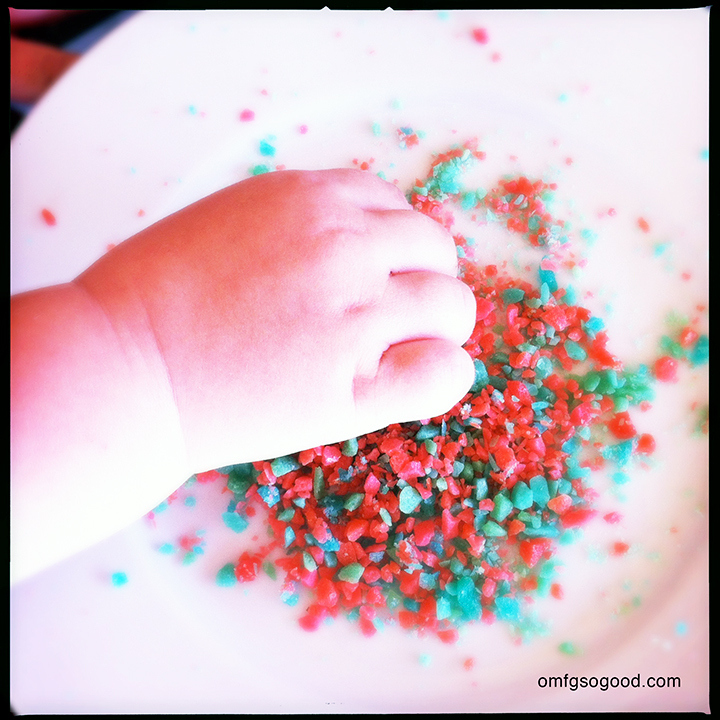 Soften the ice cream slightly, then spread it into the prepared pan to an even 1″ thickness. Freeze overnight. To make the cookies, preheat the oven to 350 degrees and line a sheet pan with parchment paper. Divide the dough into two equal portions and turn half of it out on to a lightly floured surface. 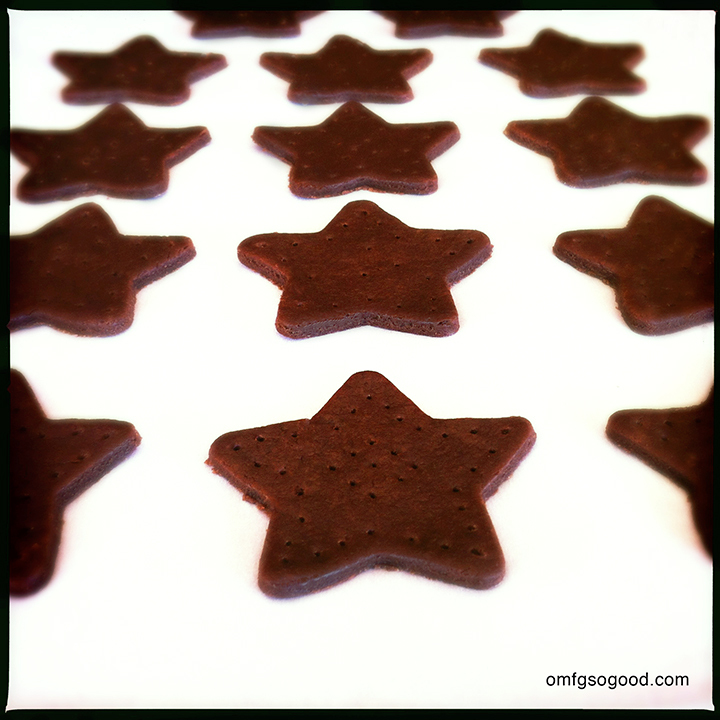 Roll the dough to an even 1/4″ thickness, then using either a round or star shaped cookie cutter, cut the dough into an even number of cookies. You could also cut the dough into 2 x 4″ rectangles if you’d prefer a classic ice cream sandwich look. Transfer the cookies to the prepared sheet pan and use a skewer or toothpick to poke a pattern of holes on each cookie to allow steam to release during baking. Roll out, cut and poke the remaining dough, re-rolling the scraps as you work. Bake the cookies in the preheated oven for 6 – 8 minutes, or until they are just set. Do not overbake or they will be too crisp. Remove the cookies from the oven and let them cool 2 – 3 minutes on the baking sheets, then transfer to cooling racks and let them cool to room temperature. Wrap the cookies in a wax paper bundle and freeze them for at least 1 hour before assembling the sandwiches. To assemble the sandwiches, match up cookies of the same size and shape and have them ready for the ice cream layer. Lift the block of firm ice cream out of the pan and place it on a cutting board. Working quickly, use the same cookie cutter to cut consistent shapes of ice cream. Using a spatula, place a layer of cut ice cream on top of a chilled cookie and sandwich with a second, then press lightly to adhere. Return the cookies to the freezer for at least 30 minutes. Now, if you don’t have crazy kids like mine (or if you’re not a crazy kid at heart like me) you can skip the fireworks. 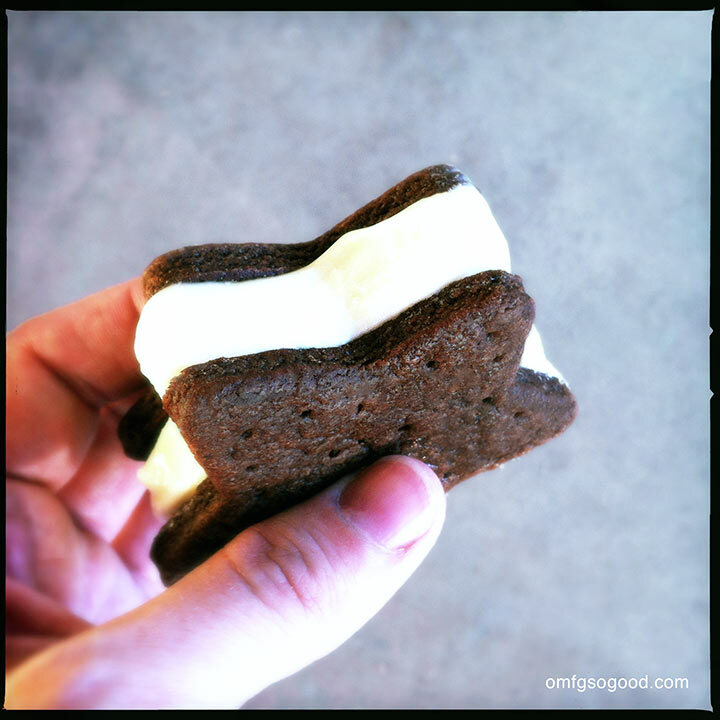 These are amazingly delicious as plain old ice cream sammies. But I highly recommend a grand finale. 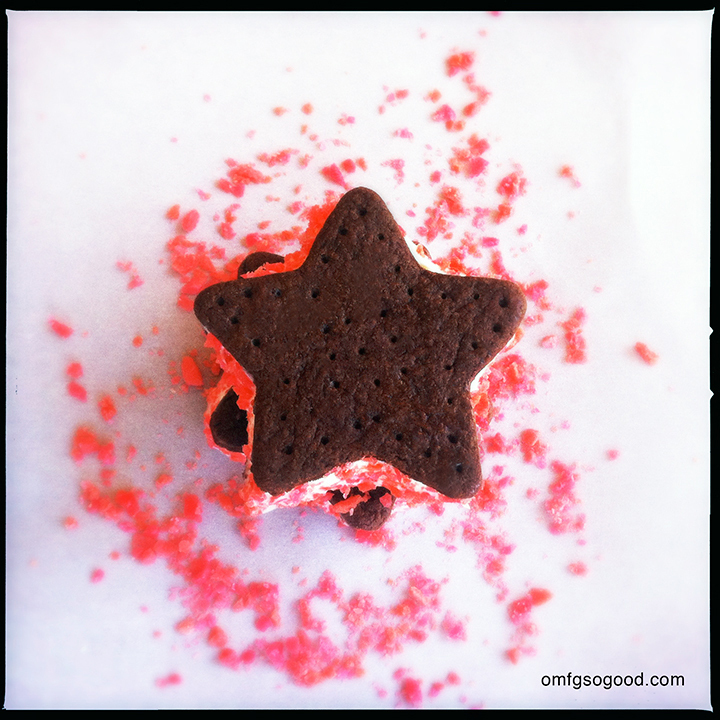 Not only were these fun to eat, but when we rolled the edges in the Pop Rocks the moisture caused some of them to POP and fly all over the kitchen. It. Was. A. Blast. Literally. My boys and I could not stop laughing, and that right there made it totally worth the mess for me. To store, wrap each sandwich individually in squares of wax paper or foil before freezing.